Amazon is currently offering a $20 credit when you use Membership Rewards points to pay for your order. To get this promotion you must link your Membership Rewards Amex card with Amazon here, use points to pay for your product, and enter SWP20AMR at checkout. I’m not sure if this is targeted, but I would assume it’s not. 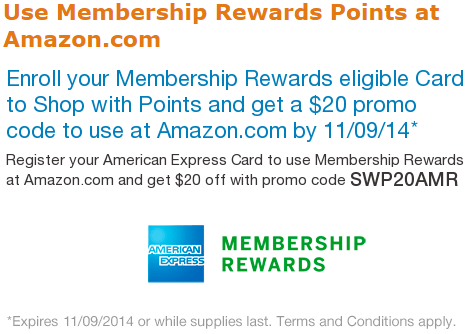 You must use at least 1 Membership Reward point to get the $20 promotion. I would suggest only using 1 point, because they are worth much more than 0.75 cents when transferred to travel partners. You cannot use a gift card and Membership Rewards. This promotion is only valid until 11/9/14, but I would act quick, because there may be a limit to how many credits they allow. Only items shipped and sold from Amazon are eligible. Gift cards are not eligible, even ones that are shipped. I tried. If you meet the requirements necessary, $20 is taken off your total order. If you buy an item that is shipped and sold by Amazon for less than $20, the promotion only takes that amount off your order. For example, if you buy a $15 item you will only get a $15 promotion, instead of the full $20. This promotion needs to be used in one purchase. This promotion is only valid for American Express cards that earn Membership Rewards (e.g Gold, Platinum, Everyday, ect.). You can go here to access this promotion and link your card. Disclosure: The links posted above are Amazon affiliate links. Thank you for your support!